Free Shipping Included! Save 1% on the Secure Set - 20 Post Kit. Fast, Secure & Safe Concrete Alternative for Easy Fence Post Installation. 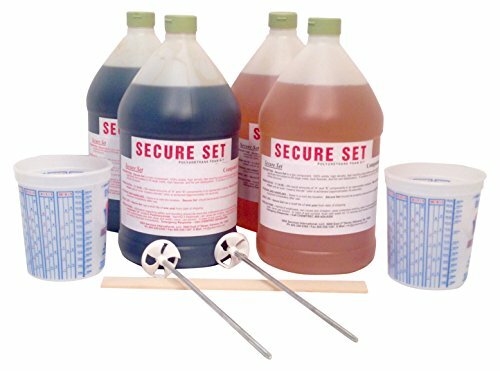 Industrial Strength - Size: 4 Gallon by Secure Set at N Online Agency. MPN: SS-4-40. Hurry! Limited time offer. Offer valid only while supplies last. For more than 17 years, Secure Set has been a reliable and trusted partner to the electric utility, communication and transportation industries. For more than 17 years, Secure Set has been a reliable and trusted partner to the electric utility, communication and transportation industries. Secure Set is now available for home DIY and commercial use. It comes in 5 sizes - single post, 5 post, 10 post, 15 post and 20 post kits (standard 4x4 posts). Secure Set is an friendly alternative to traditional concrete, works extremely fast, sets in minutes, not days. As a polyurethane closed cell foam, Secure Set is waterproof, protecting your posts below ground line, and can be installed in temperatures ranging from 0° to 100° f.
If you have any questions about this product by Secure Set, contact us by completing and submitting the form below. If you are looking for a specif part number, please include it with your message.